Stand out from the crowd with these colorful, on-trend climbing challenges. For over 20 years Spectrum Sports Intl has been creating commercial-grade climbing projects. We will work with you to ensure your project is safe, on budget, and looks amazing. 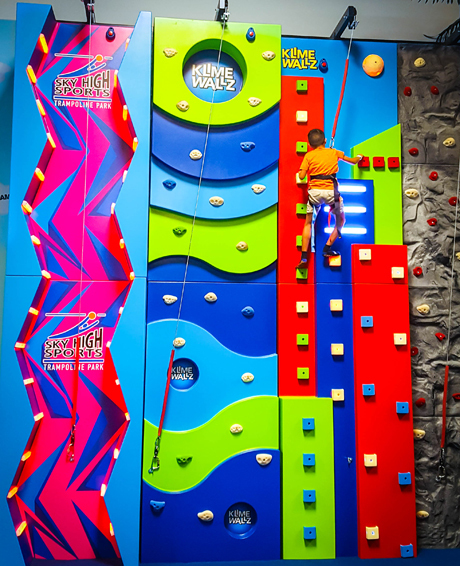 The Klime Wallz™ line consists of 24 different climbing and adventure elements. Most climbing elements are 4′ (1.2m) wide and available in heights ranging from 16′ to 24′. A steel frame and auto-belay safety system are standard. There are infinite ways we can arrange your climbing zone, but it is most common to have a line of elements across a wall, a stand-alone 4-climber tower, or some combination. There are no minimum purchase requirements. You can buy 1 climbing element if that’s all you need! However, it is cost advantageous to order at least 3-4 elements which can then share frame parts. Klime Wallz™ are elements available in 4 categories and price points: Premium Klimes, Adventure Series, Graphix Panels, and Hero Attractions. Mixing elements from each of these categories can give your patrons an exciting mix of attractions while being considerate of your budgetary needs. Premium Klimes feature unique 3D shapes. They are built from fiberglass resulting in a high strength-to-weight ratio and ensuring maximum durability. The fiberglass gel coat finishes are fun and BRIGHT, and they will NEVER wear down like painted attractions. Need to match a specific color scheme? No problem! Let us know what you have in mind, and we’ll make it happen. We highly recommend Premium Klimes for facilities with high traffic. Also, these are the climbing walls of their kind that can be used OUTDOORS since the fiberglass is 100% weather-proof. The fiberglass construction results in a premium price-point. However, it must be considered that the lifespan on these elements is double anything else on the market. Adventure Series elements place a focus on non-traditional climbing surfaces and styles. Trees, pipes, cargo nets, tires, translucent surfaces, and more add to the excitement. These are some of our favorite elements, and many are unique to Spectrum Sports Intl. Adventure Series elements are typically half the price of Premium Klimes, loads of fun, and we heartily recommend them for any project. Graphix Panels are more than a fun scene that you climb. They utilize custom climbing grips that kids love to get their hands on. We have life-size sports balls, and not-so-life-size dinosaurs, fish, emojis, and animals. The graphic is printed on the same material that is used for decals on motocross bikes. This thick material is slightly stretchy, making it able to resist blows. When shoes leave a mark, it wipes right off. Graphix Panels are VERY cost competitive. Including them in your project is a sure way to keep the cost down. Hero Attractions are specialty elements that take your adventure zone beyond climbing. The Zig-Zag-Zip is unique zip line product designed for small spaces. Zip line riders descend in a falling-leaf motion. The High-Line Slack Line takes balance, skill, and nerves. Both of these elements span between 4-climber towers. Ask our product specialists for additional details. Building a custom Klime Wallz™ is a process that you will enjoy. We will work with you to evaluate your existing space, ceiling height, and budget to determine a product mix that will maximize all of your resources. We will provide you with custom renderings to ensure that your vision is fulfilled before we close a deal. Contact us today to get this exciting process going!